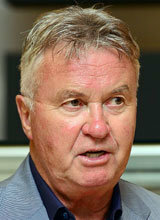 Guus Hiddink appointed coach of Chinese U-21 Olympic team. September. 11, 2018 07:45. by Yun-Cheol Jeong trigger@donga.com. Former Coach of the South Korean National Football Team Guus Hiddink, 72, has been appointed coach of the Chinese Olympic team consisting of athletes younger than 21. The Dutch coach had miraculously led Korea to the round of four of the 2002 FIFA World Cup Korea/Japan. The Chinese Football Association announced on Monday on its website to appoint Hiddink to lead the Chinese U-21 team starting from this October, saying that the team is currently training to compete in the qualification round of the U-23 Championship hosted by the Asian Football Confederation scheduled in March next year, which determines the team’s qualification for the 2020 Tokyo Olympic Games. Most players on the team are aged 21 or below, born in 1997 or so, who have geared up for the year 2020. The Chinese Football Association added that Hiddink and coaching staff will work their magic to take China to the 2020 Tokyo Olympics. While specifics of his contract have not been publicly revealed, the South China Morning Post, a Hong Kong-based newspaper, reported that Hiddink made a three-year contract with China, projecting his annual compensation to exceed four million euros or 5.2 billion won. Hiddink revealed his ambition as a new coach of the Chinese team in an interview with Veronica Inside, a Dutch media outlet. “I am nearing retirement, but luckily, I was given a great opportunity in China," the Dutch coach said. "The top priority is to grab a ticket to Tokyo. I am confident that the Chinese U-21 team deserves it."